ICEVI is implementing a Global Campaign on Education For All Children with Visual Impairment (EFA-VI) acting in partnership with the World Blind Union. With the view to strengthen the implementation of the Campaign, ICEVI is collaborating with larger initiatives on Education and also with the disability specific movements. ICEVI is a member of the Inclusive Education Task Group of the International Disability and Development Consortium (IDDC) which is taking a number of proactive measures to observe the Global Action Week (GAW) as a part of the Global Campaign for Education (GCE). 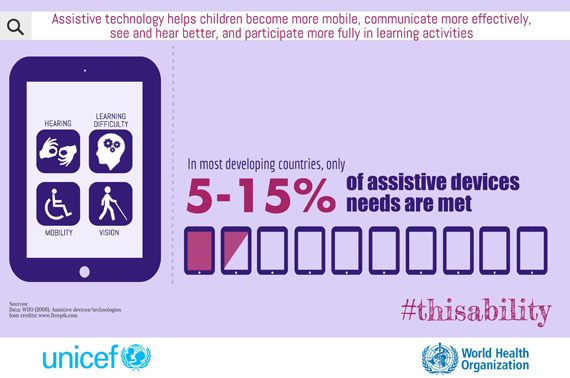 In 2014, the Global Action Week will be observed between 9th and 14th May with a special focus on disability. ICEVI has written to its regions in Africa, East Asia, Europe, Latin America, North America and Caribbean, Pacific and West Asia to observe the GAW in a fitting manner. Some of the GAW activities within ICEVI include creating awareness about the capabilities of persons with disabilities, contributing to the development of appropriate national legislations on disability, mobilizing parents’ movements, bringing out publications for awareness creation etc., and the details of ICEVI’s initiatives will be posted in this section on regular basis. 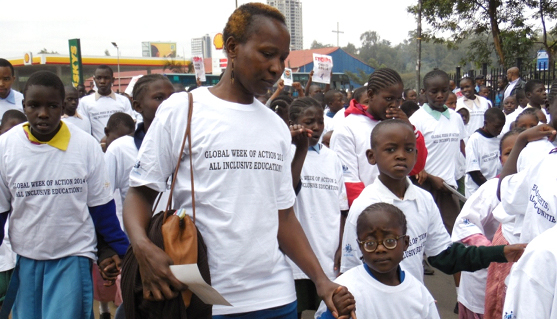 The 2014 Global Action Week on Inclusive Education in Ethiopia was observed with the theme focusing on Equal Right, Equal Opportunity: Education and Disability. 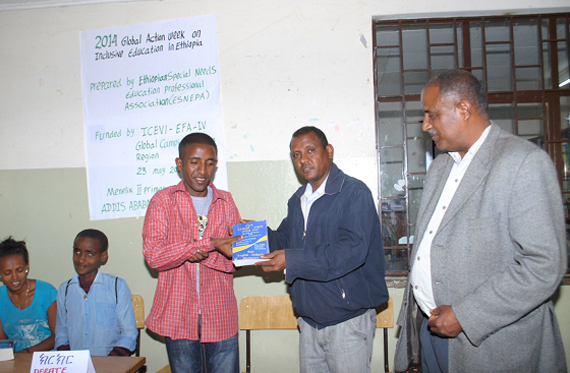 Accordingly, ESNEPA has celebrated the 2014 Global Action Week on Inclusive Education with full participation of different students with disabilities, including blind students, deaf students, physically disabled students, school teachers and directors; and other members of the Menelik II primary school. At opening session, different types of disabilities presented songs, sports and dances. Following this event, different inclusive education activities were implemented among students with visual impairments and non-disabled students. The first competition was independent poem competition among three students: two students with visual impairment and one non-disabled student. The second topic for competition was debate topic (Money-Vs- Love) competition among two students to show their accessibility to inclusive education at school settings. Two teacher judges ranked students as per their performances. Finally, each student was awarded four types of dictionaries as per their ranks by the school director. The first ranked student in Poem and Debate completion were awarded with Oxford Dictionaries respectively. 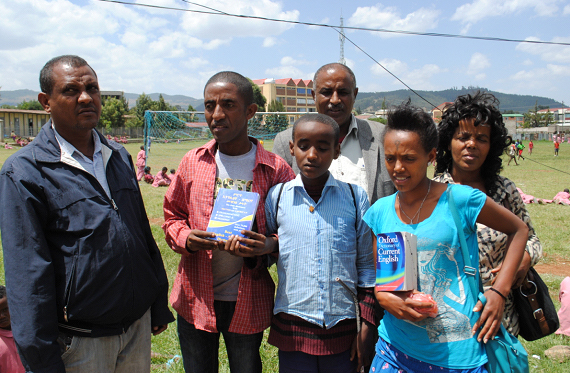 The other students who have ranked second and third in either Poem or Debate competition have been awarded different volume of Amharic–English Dictionaries. The celebration session has demonstrated real inclusive educational setting in which all children with disabilities and other non-disabled students have participated full upon the competition and other activities at educational inclusive setting. In Kenya, the implementation of Free Primary Education (FPE) program has led to increased enrolment of both regular and Special Needs Education students in public schools, and has increased the demand for Special Education trained teachers as well as relevant infrastructure and learning materials. Elimu Yetu Coalition (EYC), which is the GCE national representative in Kenya and the Kenya Union of the Blind (KUB) also the nodal agency responsible for ICEVI-EFA-VI Campaign implementation in Kenya among other partners, domesticated the GAW theme and run its campaign on Equal Rights, Equal Opportunities: Inclusive Education for Children with Disability. 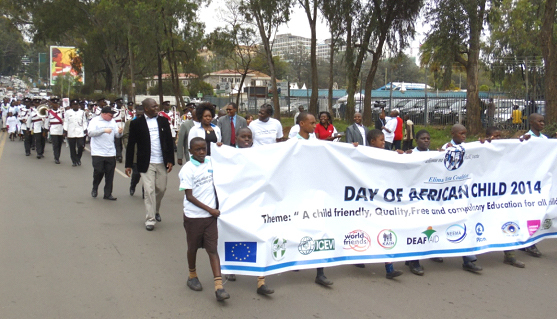 The coalition rallied the Ministry of Education, Teachers Service Commission, Kenya Institute of Curriculum Development, development partners, various disability agencies, Civil Society Organizations in Kenya, teachers, students, education campaigners and members of the public to take part in the GAW. The cold morning of (Day of African Children) June 16th 2014 could not deter education campaigners from defending the rights of children living with disability. Even the children braved the weather and showed up to make their voices known. With a sure stamping of the Ministry of Education and Civil Society in Kenya, the GAW/DAC celebrations became the highlight of the day, both in the streets of Nairobi and in the Media. Professor Jacob Kaimenyi, Cabinet Secretary for Education flagged off the event, which was not only marked with an inclusive theme but also an inclusive mind. The venue (Uhuru Park) was quite accessible both for participants getting in by car, wheel cheer or on foot. Campaign materials were also transcribed in Braille and sign language experts were hired to ensure everyone was reached out. Besides, every artist identified to perform was living with a unique disability. A good coordination with security officers ensured there were no casualties. Meanwhile Neema Hospital, sponsored by World Friends, was offering free medical services to participants in a fete attracted more than 800 education campaigners including students with various forms of disability. According to the UNICEF State of the World Children 2013 report, about 93 million children in the world live with a disability. In most low and middle income countries like Kenya, children with disabilities are more likely to be out of school than any other group of children. 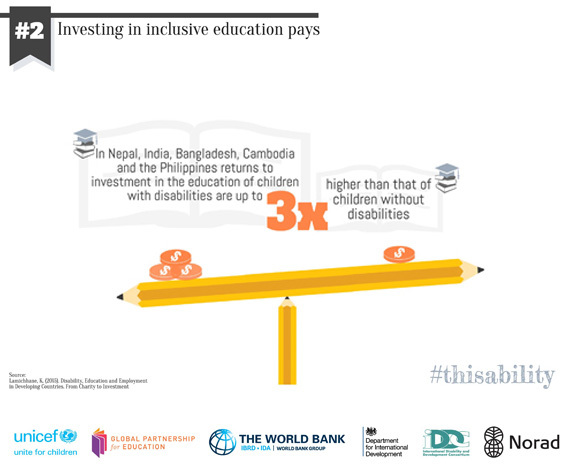 Even if they do attend school children with disabilities are often more likely to drop out of school before completion. According to the World Health Organization Report 2011, in a survey of 51 countries, only 51% of boys and 42% of girls with disability actually complete primary school. 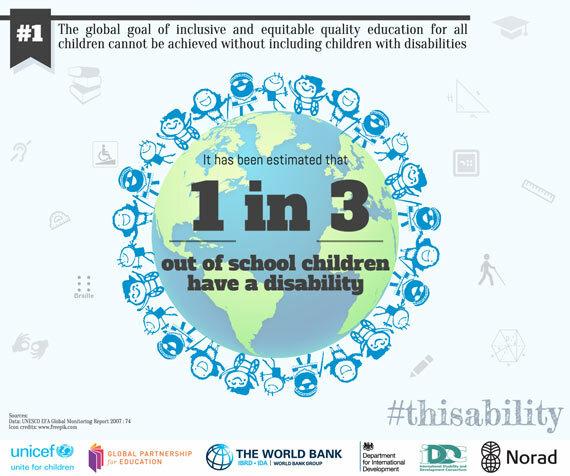 In some countries, having disability can more than double the chance of a child not being in school compared to their peers without disability. In Kenya, it is estimated that more than 80% of children living with disabilities have no access to education. 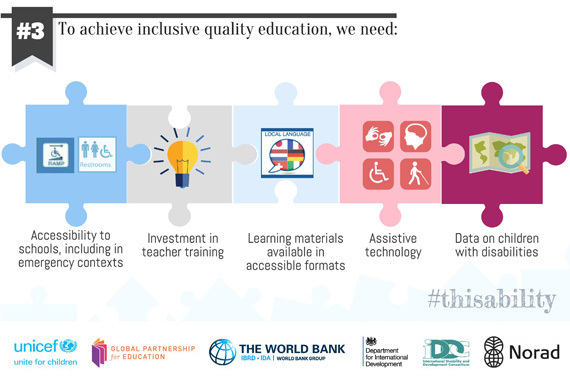 That is why the Global Campaign for Education turned the attention of duty bearers to education and disability during the 2014 Global Action Week.